This is a pretty easy way to reuse old tees. I made this one out of my old band t-shirts. I cut the logos into squares and am currently working on a quilt made out of them and some other old, torn clothing. I thought it was a good way to reuse them and preserve the memories, since my band tees were the uniform of my high school and college years. It put something old that I didn’t just want to throw out to good use, but I had all the rest of the t-shirts left over. So I made this. -Cut the t-shirts into strips. Mine were about 2 cm or 1/2 inch wide. I just cut around in a circle, so I had one big, long strip. I left the seams in tact. -Pull out your strips so they stretch out. Make sure you don’t pull so hard where the seams are, because they’ll probably come undone and you’ll make more work for yourself. -Voila. You have a ‘yarn.’ Now you can crochet! I used an 8 mm/UK 0/US L hook. -I did a single crochet, but you can play around with it. -I crocheted a chain, then crocheted around it to make an oval. To make sure the rug lay flat, I doubled up crochets in some of the stitches in the parts where the oval rounded (I hope that makes sense!) I’m a beginner crocheter, so I have no idea if this is the ‘correct’ way to do an oval, but it worked for me. The amount you need to chain and how many rows you do will depend on how large you want your rug. i so wanna do this! 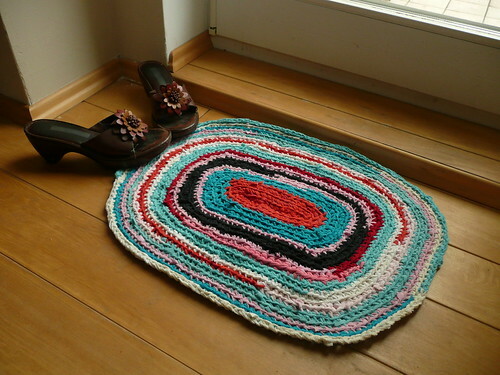 you are crocheting in the round, or…? what do you mean by crocheting around the chain? i am a new crocheter, forgive me! Hey sorry about my very late reply…I’ve taken a long absence from blogging! What I did was I made a chain, then did a second row on that chain. Then, instead of starting a new row, I crocheted around the end of the chain. I did the ends like you do a circle (doubling up on some stitches) and the long parts of the oval as single crochets.